The casual visitor would be hard pressed to work out what was going on here. 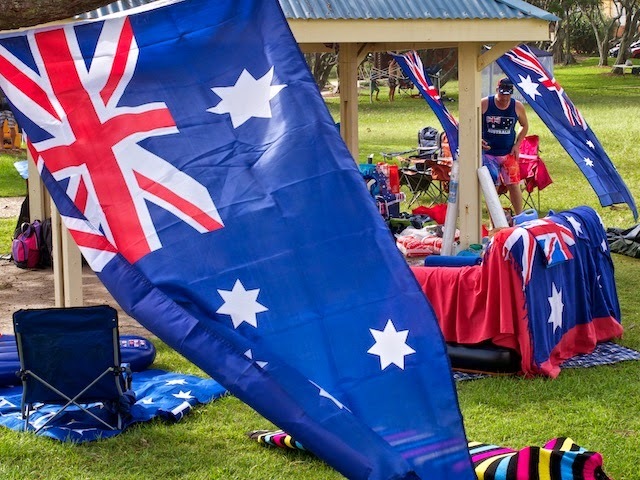 Today is Australia Day, a national holiday celebrating many things, but historically the landing of the first settlement fleet in 1788. Not everyone stays home in a darkened room on this day, some of the occupants of this picnic shelter for instance had camped overnight to ensure the pick of the spots was theirs. By seven in the morning they had lounge chairs, tables, tents, marquees, a massage area (for the girls) and enough flags decorating their picnic to sink a fleet. They were waiting on the arrival of a twenty metre water slide and a few more car loads of people, food and refreshment when we left them. By nine, at the rate others were arriving to set up their own little parties, there will be standing room only in the park! The flag's such a standout design.